Last night I visited E.G. 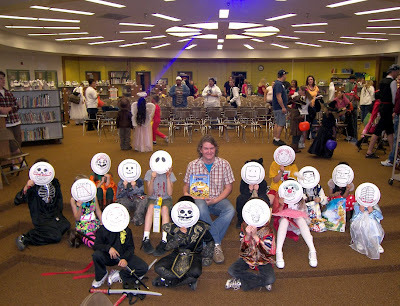 King Elementary in Layton, UT for their Spooky Literacy Night. I It was a wild time. For my costume I drew 25 different "masks" on paper plates. Choosing the final mask was part of my program. The kids went BANANAS. It ended up being a shouting match for each mask. 200 costumed kids screaming bloody murder while I threw paper plates at them. It was a lot of fun. I lost my voice. Yeah, so I had a few posts planned for October that observant readers will notice didn't happen. Don't worry, November will catch them up. The Devil You Know on the cheap! 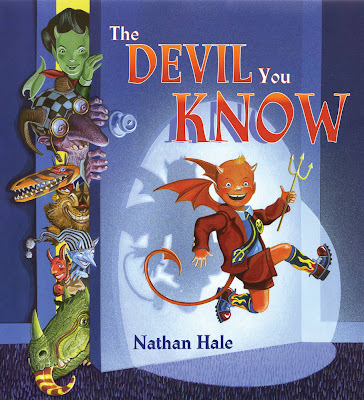 My first picture book, The Devil You Know, is on sale right now at Amazon. $4.99 while supplies last on this page. In hardcover even! Just in time for Halloween. Don't miss out on the chance to bring the little devil home for cheap! [UPDATE] Sale's over! Hope you were able to snap one up--that was a sweet deal. You now have to pay the regular full price to bring home the lil' Devil. In last week's Shannon Hale interview, I talked about my favorite characters from Yellowbelly and Plum go to School. I mentioned a few characters who were changed for the final illustrations. The Cactus Boy and the Shark Girl can be seen here, on this missing page from Yellowbelly and Plum Go To School. This was my sample illustration when I first pitched the project to the publisher. When I send a story to an editor, I send it in sketch form, a rough pencil version of the whole book called a "Dummy." 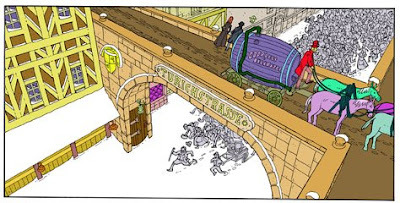 But along with the sketches, I send one illustration that shows what the final would look like. Many changes take place once the book gets under way, see for example, how different Plum is here. The sample illustration never actually goes into the final book, which is kind of sad in this case, since I really like how this one turned out. Tonight I will be at the Barnes & Noble in Orem signing books and hanging out. A bunch of other Utah authors and illustrators will be on hand as well. Who? Well you'll have to come and see. Friday, Oct 17, 7:00 pm Orem B & N. See you there. The team of color mappers has been a HUGE help. They've now been working for about a month. Everyone's moving at a different pace, but the pages are rolling in. As of today Calamity Jack is half-way color mapped. If you don't know what color mapping is, take a look at my earlier coloring tutorial. Essentially, the team is doing the painstaking job of outlining each color area. Every little hat, braid, brick and cloud has to be carefully traced. The team is doing fantastic work. Are those My Little Ponies? What is going on here? These scenes are all within the same few pages of each other, I love the drastic differences. It'll be sad to mellow everything down to the final color scheme. These color mapped pages will all get the official palette treatment, then have highlights and shadows added. Last of all, I did an interview for Shannon Hale (one of the authors of Rapunzel's Revenge) you can see it here. Thanks Shannon! 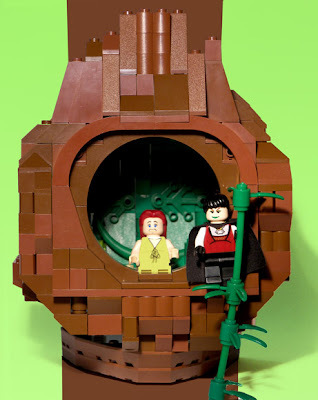 When you try to recreate a scene in LEGO, the biggest problem is hair. It's hard to create a good likeness of someone, when you only have a handful of hair pieces to choose from. There is no LEGO hair piece with twenty foot braids. So I went with a pre-braids scene; Mother Gothel visiting the tree tower. Ta-daah! It's a little rough, I am under deadline. And I had to fake Rapunzel's yellow dress, that's a white dress Photoshopped yellow (Marion's dress from the Indiana Jones tomb set--because I know you were wondering.) But for a two hour, Sunday night build, I'm pretty happy with it. So what do you think? Should I keep posting the LEGO stuff? If I do enough of these, maybe I can write off LEGO purchases as a work related expense. I came home from running errands the other day, and there was a strange guy on my lawn. He explained that he had just moved into the house next door. He seemed like a pretty nice guy, he said he was a musician. I asked him what instrument he played. "Rap." he said, "My name's Brian, but my friends call me B-Money." I've been to that Burger King--I had no idea there was a hot tub in it. Well, okay, maybe it is a little too early for PaleoChristmas. We've got big plans at the space station for October. Although the ongoing Calamity Jack ink-o-thon is going full blast, I hope to post the following items here on the blog this month. Yellowbelly, the lil' Devil, and Rapunzel will all be posting their top three favorite songs for your listening enjoyment. The Calamity Jack color mappers are producing some pretty extravagant colored pages, we'll preview a few more pages from the upcoming Rapunzel sequel. Commenter Erin threw down a challenge to build a LEGO Rapunzel, the answer to that should be up next week. Last of all, a little BLAGGING, or would it be BROGGING? Bragging on a blog, but hey isn't all blogging really just a form of bragging? Anyway, I'm dying to show off a little. 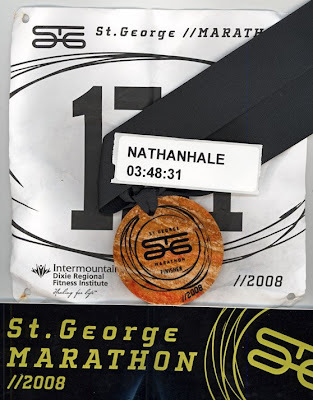 I've been a fan of long distance running since high school, and saturday was a big race for me. It's never too early for PaleoChristmas! Today is a book launch day! 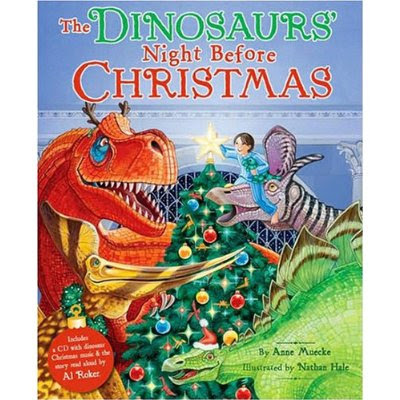 The Dinosaurs' Night Before Christmas by Anne Muecke, illustrations by Nathan Hale, is in stores TODAY! It can also be found here. This book is jam packed with Dinosaurs and Christmas! Proceeds from the book will go to the Museum of Natural History in New York, where the book takes place. The book also comes with a little surprise, inside the front flap is a CD of Dinosaur themed Holiday Music. With hits like, "Hark! The Pterodactyls Sing!" and "We wish you a Dino Kwanzaa!" My kids played the CD non stop while I was working on this job (this was last March--I'm sure it sounds even better during the holidays.) Also on the disc is a full reading of the book, by non other than Mr. Book of the Month, Al Roker! 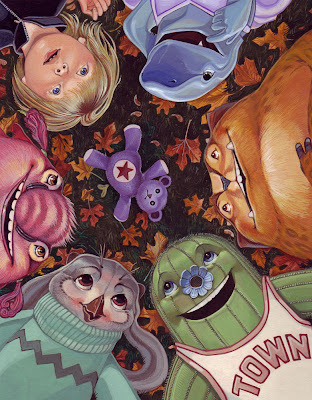 Here is one of my favorite paintings from the book. This is the title and copyright page. This is Argentinosaurus, walking past parked cars on a New York Street. Each of these cars is a great car I've either owned or spent time in. Starting on the left with my first car, an '82 Toyota Corolla Wagon. I loved that car. My little brother burned the engine out near Scipio Utah. I believe it is still there. Sniff. I'll do more Dinosaur Christmas posts as we get closer to December. But today is launch day, so happy Oct 1st. Remember kids, this is the time of year when Santasaurus starts watching you.